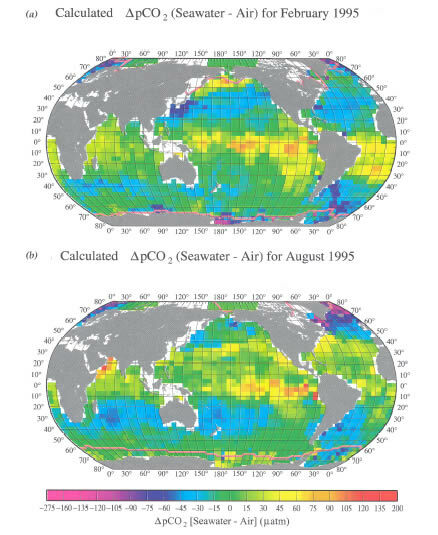 Figure 3 shows the distribution of climatological mean sea-air pCO difference ( pCO ) during February (Figure 3a) and August (Figure 3b) for the reference year 1995. The yellow-red colors indicate oceanic areas where there is a net release of CO to the atmosphere, and the blue-purple colors indicate regions where there is a net uptake of CO . The equatorial Pacific is a strong source of CO to the atmosphere throughout the year as a result of the upwelling and vertical mixing of deep waters in the central and eastern regions of the equatorial zone. The intensity of the oceanic release of CO decreases westward in spite of warmer temperatures to the west. High levels of CO are released in parts of the northwestern subarctic Pacific during the northern winter and the Arabian Sea in the Indian Ocean during August. Strong convective mixing that brings up deep waters rich in CO produces the net release of CO in the subarctic Pacific. The effect of increased DIC concentration surpasses the cooling effect on pCO in seawater during winter. The high pCO in the Arabian Sea water is a result of strong upwelling in response to the southwest monsoon. High pCO values in these areas are reduced by the intense primary production that follows the periods of upwelling. Figure 3. Distribution of climatological mean sea-air pCO difference ( pCO ) for the reference year 1995 representing non-El Niño conditions in February (a) and August (b). These maps are based on about 940,000 measurements of surface water pCO from 1958 through 2000. The pink lines indicate the edges of ice fields. The yellow-red colors indicate regions with a net release of CO into the atmosphere, and the blue-purple colors indicate regions with a net uptake of CO from the atmosphere. The mean monthly atmospheric pCO value in each pixel in 1995, (pCO )air, is computed using (pCO )air = (CO )air × (Pb - pH2O). (CO )air is the monthly mean atmospheric CO concentration (mole fraction of CO in dry air) from the GLOBALVIEW database (2000); Pb is the climatological mean barometric pressure at sea level from the Atlas of Surface Marine Data (1994); and the water vapor pressure, pH O, is computed using the mixed layer water temperature and salinity from the World Ocean Database (1998) of NODC/NOAA. The sea-air pCO difference values in the reference year 1995 have been computed by subtracting the mean monthly atmospheric pCO value from the mean monthly surface ocean water pCO value in each pixel. The temperate regions of the North Pacific and Atlantic oceans take up a moderate amount of CO (blue) during the northern winter (Figure 3a) and release a moderate amount (yellow-green) during the northern summer (Figure 3b). This pattern is the result primarily of seasonal temperature changes. Similar seasonal changes are observed in the southern temperate oceans. Intense regions of CO uptake (blue-purple) are seen in the high-latitude northern ocean in summer (Figure 3b) and in the high-latitude South Atlantic and Southern oceans near Antarctica in austral summer (Figure 3a). The uptake is linked to high biological utilization of CO in thin mixed layers. As the seasons progress, vertical mixing of deep waters eliminates the uptake of CO . These observations point out that the pCO in high-latitude oceans is governed primarily by deepwater upwelling in winter and biological uptake in spring and summer, whereas in the temperate and subtropical oceans, the pCO is governed primarily by water temperature. The seawater pCO is highest during winter in subpolar and polar waters, whereas it is highest during summer in the temperate regions. Thus the seasonal variation of pCO and therefore the shift between net uptake and release of CO in subpolar and polar regions is about 6 months out of phase with that in the temperate regions. The gas transfer velocity is controlled by near-surface turbulence in the liquid boundary layer. Laboratory studies in wind-wave tanks have shown that k is a strong but non-unique function of wind speed. The results from various wind-wave tank investigations and field studies indicate that factors such as fetch, wave direction, atmospheric boundary layer stability and bubble entrainment influence the rate of gas transfer. Also, surfactants can inhibit gas exchange through their damping effect on waves. Since effects other than wind speed have not been well quantified, the processes controlling gas transfer have been parameterized solely with wind speed, in large part because k is strongly dependent on wind, and global and regional wind-speed data are readily available. Several of the frequently used relationships for the estimation of gas transfer velocity as a function of wind speed are shown in Figure 4 to illustrate their different dependencies. For the Liss and Merlivat (1986) relationship, the slope and intercept of the lower segment was determined from an analytical solution of transfer across a smooth boundary. For the intermediate wind regime, the middle segment was obtained from a field study in a small lake, and results from a wind-wave tank study were used for the high wind regime after applying some adjustments. This relationship is often considered the lower bound of gas transfer-wind speed relationships. Figure 4. Graph of the different relationships that have been developed for the estimation of the gas transfer velocity, k, as a function of wind speed. The relationships were developed from wind-wave tank experiments, oceanic observations, global constraints and basic theory. The different forms of the relationships are summarized in Table 1. U is wind speed at 10 m above the sea surface. The quadratic relationship of Wanninkhof (1992) was constructed to follow the general shape of curves derived in wind-wave tanks but adjusted so that the global mean transfer velocity corresponds with the long-term global average gas transfer velocity determined from the invasion of bomb C into the ocean. Because the bomb C is also used as a diagnostic or tuning parameter in global ocean biogeochemical circulation models, this parameterization yields internally consistent results when used with these models, making it one of the more favored parameterizations. Using the same long-term global C constraint but basing the general shape of the curve on recent CO flux observations over the North Atlantic determined using the covariance technique, Wanninkhof and McGillis (1999) proposed a significantly stronger (cubic) dependence with wind speed. This relationship shows a weaker dependence on wind for wind speeds less than 10 ms and a significantly stronger dependence at higher wind speeds. However, the relationship is not well constrained at high wind speeds because of the large scatter in the scarce observations. Both the U and U relationships fit within the data envelope of the study, but the U relationship provides a significantly better fit. Nightingale et al. (2000) determined a gas exchange-wind speed relationship based on the results of a series of experiments utilizing deliberately injected sulfur hexafluoride (SF ), He and non-volatile tracers performed in the last decade. The global oceanic CO uptake using different wind speed/gas transfer velocity parameterizations differs by a factor of three (Table 1). The wide range of global CO fluxes for the different relationships illustrates the large range of results and assumptions that are used to produce these relationships. Aside from differences in global oceanic CO uptake, there are also significant regional differences. Figure 5 shows that the relationship of W&M-99 yields systematically lower evasion rates in the equatorial region and higher uptake rates at high latitudes compared with W-92, leading to significantly larger global CO uptake estimates. Figure 5. Effects of the various gas transfer/wind speed relationships on the estimated air-sea exchange flux of CO in the ocean as a function of latitude. The global effects on the net air-sea flux are given in Table 1. In addition to the non-unique dependence of gas exchange on wind speed, which causes a large spread in global air-sea CO flux estimates, there are several other factors contributing to biases in the results. Global wind-speed data obtained from shipboard observations, satellites and data assimilation techniques show significant differences on regional and global scales. Because of the non-linearity of the relationships between gas exchange and wind speed, significant biases are introduced in methods of averaging the product of gas transfer velocity and wind speed. The common approach of averaging the pCO and k separately over monthly periods, determining the flux from the product and ignoring the cross product leads to a bias that is about 0.2 to 0.8 Pg C yr lower in the global uptake estimate. This bias shows a regional variation that is dependent on the distribution and magnitude of winds. This issue has been partly rectified in some of the relationships in which a global wind-speed distribution is used to create separate relationships between gas transfer and wind speed for short-term (a day or less) and long-term (a month or more) periods. Since wind-speed distributions are regionally dependent and vary on time scales of hours, this approach is far from perfect. The groundwork of efforts laid over the past decade and recently improved technologies make the quantification of regional and global CO fluxes a more tractable problem now. Satellites equipped with scatterometers that are used to determine wind speed offer daily global coverage. Moreover, these instruments measure sea-surface roughness that is directly related to gas transfer. This remotely sensed information, along with regional statistics of wind-speed variability on time scales shorter than a day, offers the real possibility that more accurate gas transfer velocities will be obtained. Efforts are underway to increase the coverage of pCO through more frequent measurements and data assimilation techniques, again utilizing remote sensing of parameters such as sea-surface temperature and wind speed. Better quantification of the fluxes will lead to better boundary conditions for models and improved forecasts of atmospheric CO concentrations.